You may remember that we recently had a request for help from our friend Brima James Kabia in Newton. 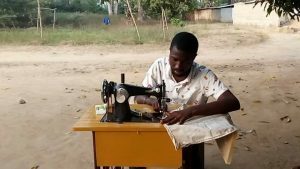 He wanted to set up a dressmakers/tailoring business for young people who had missed out on education. 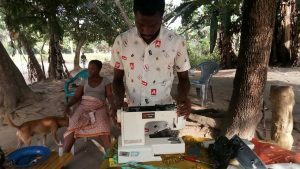 He asked for manual and electric sewing machines plus a small generator and we were delighted that, with the help of the charity ‘Workaid’, we were able to send them. 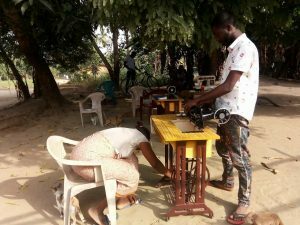 Brima James Kabia has recently sent us these photos of the tutor testing the machines, and our friend Mariatu, working the pedals. It has been suggested that they start the enterprise with five pupils, and they are hoping for more. 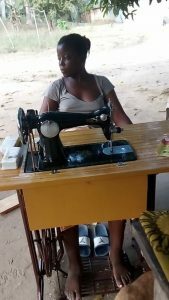 More electric sewing machine are wanted but it seems that things are progressing well.